The modern search for the Leonardo fresco, commonly referred to as The Battle of Anghiari finds its roots in archival research by art historian Professor Rab Hatfield of the University of Syracuse in Florence. The following post will present a synopsis of Hatfield's book on the subject, followed by an interview. Even to imagine what the completed mural decorations of the Great Hall might have looked like is beyond the capabilities of most of us. But let us at least try to recapture what little of them we can. For those interested in a visual description of Hatfield's involvement, please watch the following video, an excerpt from a 2004 documentary produced by Darlow Smithson. Finding Leonardo is a small paperback volume, arranged logically in a manner reflecting an extended lecture presentation - from which the book was originally derived. Included are schematic diagrams to illustrate the arrangement of the Great Hall (later called the Salon of the 500) and demarcate the section of wall upon which Leonardo is believed to have painted his fresco. These conclusions are based on an astounding array of often scraps of information which Hatfield unifies into a compelling case. To avoid confusion, I would like to clarify some of the conventions around naming this scene. In current reports the Battle of Anghiari is used as both the name of the entire planned scene and seems to have supplanted the name of the segment Leonardo started painting. The section suggested by copies, featuring the men and horses in battle depicts the Capture of a Standard - which is how Hatfield addresses it in his presentation. 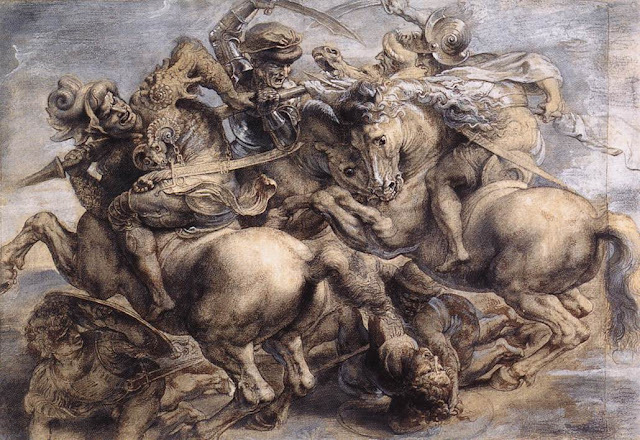 Other versions, such as Rubens' famous copy (below) is often called Battle of the Standard, a variation of this. A somewhat conflicting account comes from Anton Francesco Doni, commenting in 1549 - in a document first published in 1759 (Bottari), translation by Hatfield. E salito le scale della Sala Grande, diligentemente date una vista a un gruppo di cavalli, e d'uomini (un pezzo di battaglia di Lionardo da Vinci) che vi parrà una cosa miracolosa. And having climbed the stairs of the Great Hall, diligently take a look at a group of horses and men (a battle piece by Leonardo da Vinci), which will strike you as a most miraculous thing. Three first-hand accounts state or imply that already in the mid-sixteenth century the painting was in poor condition, due largely to the way Leonardo had prepared the surface on which he painted it. An inspection of the copies shows that it may have been deteriorating noticeably before it was covered up or destroyed around the end of 1570. If it was not destroyed at that time, the scene must nevertheless have suffered during the two times the Hall was occupied by soldiers. Further damage must have occurred when Vasari raised the wall on which it is painted, and again when he put a huge stone frame around or across the piece of wall it occupies and yet again when he built his incrustation [add-on 'wall' which Vasari's fresco is on] in front of it....But the painting was still in good enough condition in 1549 - that is, probably after Vasari wrote his dismissive words about it (but before he renovated the Hall) - that the writer Anton Francesco Doni, a friend of Michelangelo, could consider it in that year to be one of the most beautiful works in Florence and call it "a miraculous thing". Locating the fresco, and the suggestion of another? A vital piece of information pointing to the possible location of Leonardo's fresco was published by Berti in 1993 - the memoirs of the early sixteenth century historian Bartolomeo Cerretani. The following excerpt is cited as made in the summer months of 1505. Im questo tempo Lionardo da Vincci, maestro grandissimo et fiorentini di pittura, cominc[i]ò a dipingere la Sala del Consiglio in quella faccia sopra dove stanno et [sic] 12 Buoni Huomini, et fessi amattonare quel'andito del Palazo in Sala con matoni quasi tonddi, et apichòsi in Sala detta nove nadiere toltte al signore Bart[olome]o d'Alviano più g[i]orni fa. At this time, Leonardo da Vinci, a very great Florentine master of painting, began to paint the Hall of the Council on that wall over where the Twelve Good Men are ; and that hallways from the Palace to the Hall was caused to be paved with nearly round bricks ; and nine flags taken from Lord Bartolomeo d'Alviano a few days ago were hung in the said Hall. It is not easy to reconcile the information found in the Madrid Codices with that provided by Cerretani. If Leonardo began to paint - or at least tried to - on or before June 6, 1505, why does Cerretani imply that he began around August 16? Did Leonardo begin twice? The focus is then shifted towards the specific location Leonardo chose to start - pointing out that the analogous nature of the Capture of a Standard to be depicted by Leonardo (from the Battle of Anghiari) and the very recent capture of flags at San Vincenzo. But if Leonardo in fact began to paint the Capture when Cerretani implies he did...what was it that prompted him to start painting that particular scene at that particular time? 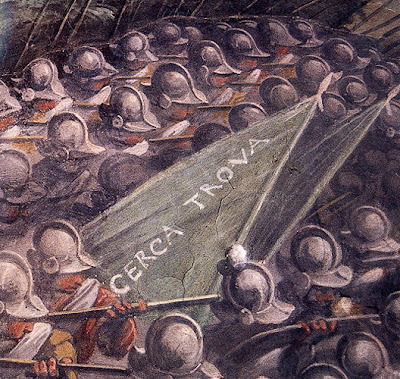 Might he have started to paint it because of the Rout of San Vincenzo and the captured flags?...Leonardo in all likelihood had already been painting for at least two months and eleven days when the Rout of San Vincenzo occurred. He would therefore have already been working on a different scene and interrupted his work in order to paint the Capture instead. If so, there once were - and possibly still are - the beginnings of another scene by Leonardo on the east wall of the Great Hall also, perhaps near that wall's southern end. It must be admitted, reading this section seemed to stand out from other elements of the presentation. Hatfield delivers the bulk of the evidence in a very methodical manner, yet this particular excursion contains a myriad of suppositions, evident in the great amount of question marks littering the page. To arrive at a fuller picture, we must dive into the endnotes. This possible other scene might have been the so-called Cavalcade, showing a reserve corps about to go into action. The wall's southern end is where the representation of the whole battle probably was to have begun. The theory just proposed could explain why the cartoon tore, the water spilled and the jug broke when the storm occurred on 6 June 1505, as the southern end of the wall was close to what may then have been the Hall's three largest windows ; in any case the window in the middle of the south wall almost certainly was by far the largest in the room ; My thanks to Maurizio Seracini for pointing out this possibility to me. In the bulk of discussion about the search for Leonardo's fresco, including until recently - there has been no prominent mention of this hypothetical opening phase of the work. Whether it still figures in Seracini's plans remains to be seen - what can be stated at this point is that the arguments are based on a great deal of assumption that is not clearly corroborated by the evidence. It is hence understandable that the eventual focus of the investigation shifted to the location noted by Cerretani. To arrive at the location Leonardo depicted the Capture of a Standard, the collation of the primary source accounts culminated in six conclusions, which invariably suggested the point to begin the search in the investigation to find any remnant of the fresco. Hatfield's conclusions are summarised below - the word probably has been kept intact to indicate statements made that could not be conclusively proven from archival sources. The diagram below provides a visualisation of the layout of the Hall suggested by the collation of accounts. 1. The Signoria sat on the eastern side of the Hall. 2. The Twelve Good Men [probably] sat at the left of the Signoria. 3. The benches on which the Twelve sat [probably] began 5.3m from the seat of the Gonfalonier of Justice, who sat in he middle of the Signoria. 4. The Twelve [probably] sat on two rows of benches, occupying around 3.5m lengthwise. 5. The fresco section Leonardo commenced was [probably] about 3m by less than 5m high. 6. The wall the fresco was on was 11.1 or 11.7m high. Hence, the focus of the present investigation is in the region above where it is believed the Twelve Good Men sat, which also corresponds to the Cerca Trova (seek and you shall find) inscription left by Vasari on the fresco. As can be noted, the location of the Twelve Good Men is concluded by Hatfield in language stating it was probably in this part of the Hall. A more detailed rationale is provided in the account, which is best summarised here for the sake of completeness. Hatfield confirms "there are no useful known descriptions" of how the respective groups sat in the Great Hall. Instead, he arrives at this conclusion by first considering that it was customary for the more honorable officials to be seated at the right of the Signoria, which is likened to formal placements of Christ at the right hand of the father, or the most honoured guest being afforded a position to the right at a formal dinner. From extant copies, it is also noted that a prominent light source has been depicted by Leonardo coming from the right. In each of the surviving copies, this can be clearly seen in the darkened shading indicated on the left sides of the figures and horses in the scene. Hatfield notes this lighting direction was not conventional for the period and more likely denotes that Leonardo was emulating a real light source from the right. A documentary source attests that windows that had been put into the eastern wall in 1496 had been walled up in 1504, likely in preparation for its decoration. The only light source for the east wall that a person looking at Leonardo's scene might have noticed then, would have been the two groups of windows in the end walls. These, according to Vasari, originally had been the Hall's only source of illumination...the reason why Leonardo chose to illuminate his scene from the right was probably that he knew he was going to position the scene in the right half of the wall, closer to these south windows. That way, it would look as if the light from these windows were illuminating it. 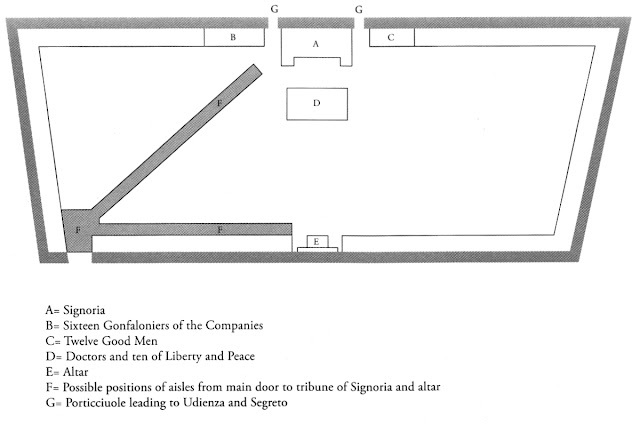 Another document - a record of payment to a woodworker in 1504 - confirms 16.65m of benches were to be made for the passageway of the Great Hall, across from where the Sixteen Gonfaloniers sat (F and B on the above diagram, respectively). This entrance was at the end of the then partly open hallway connecting the new Hall with the old one on the north side of the Palace as was - and still is - in the Palace's northwest corner. The passageway in question, as well as the Sixteen Gonfaloniers, must have been to the north of the...Signoria or to the left of the person looking at it...The Twelve Good Men - and with them Leonardo's Capture of a Standard - would therefore have been the south of the residenza of the Signoria or to the right of a person looking at it. Hatfield also add that Doni's description of viewing the scenes after climbing stairs is congruous with a flight of stairs that were near the main entrance to the Hall in Doni's day. Hence, climbing these stairs would give a direct view of the scene above where Doni confirms the Twelve sat. Finding Leonardo is the key reference on the archival research underlying the high publicity search. Given the massive profile of the investigation, it is somewhat pleasant to find the crux of this evidence presented with as little hype and fanfare as possible, in an unassuming little paperback. Apart from the "second scene" suggestion, there is very little in this book which is not thoroughly referenced and cross checked, a heartening testament to the importance of primary sources informing ongoing research. Kudos to Professor Hatfield for his dedication to archival evidence, and to The Florentine Press for helping spread these findings to a greater audience. 3PP was honored to have the opportunity to ask Professor Hatfield some questions pertaining to Finding Leonardo and his distinguished work in Renaissance art history. 3PP Vasari's account of the deteriorated state of Leonardo's fresco is perhaps the most graphic - is the difference between his account and that of Anton Francesco Doni in 1549 problematic? RH Yes, it is a problem. I have never figured out why Vasari makes it sound to his reader as if Leonardo hardly painted anything at all. In any case, we must trust Doni. One does not write to a friend living in another city to come and see something if the something in question is a total wreck. 3PP The modern perception of Renaissance art and history arrived via the filter of 19th century writers such as Burckhardt, Ruskin and English translations of Vasari. Is there a discrepancy between these accounts and the facts revealed to us from primary source accounts? RH No, there is no real discrepancy. It is just that the primary sources give us a more accurate idea of what really happened. 3PP Discoveries in archival entries are often related as serendipitous - is this accidental finding of valuable glimpses into the past a common occurrence, or does this perception exist because such cases are more commonly reported and turned into books? RH Most of my discoveries have been serendipitous, sometimes amazingly so. And in all cases unexpected. I imagine it is the same for most other researchers. As a rule, you rarely find what you are looking for, but you find something else instead. 3PP Dr. Cristina Acidini affirmed the sampling was being done on the correct wall. Seracini's team encountered resistance to their drilling of Vasari's fresco on this wall - a technique not uncommon in conservation of monumental works. As the identification of this wall was derived from your own research - how do you feel about the reaction to investigation so far? RH I was very distressed by the reaction, which I found inappropriate (no one is doing any harm to Vasari's fresco) and usually based on inadequate knowledge. 3PP [As Raphael is a great focus of my own work and admired by many 3PP readers] Have your archival adventures ever mentioned or encountered Raphael? RH I have encountered Raphael a couple of times, but what I came up with wasn't important. 3PP Your publications on Michelangelo's wealth introduced us to the side of Renaissance artistic endeavour that seems far removed from the romanticised ideals many are accustomed to. What do these financial accounts tell us about the reality of artistic practise during this period? RH They tell us that artists were professionals who lived in the real world, just as many professionals, such as those who work in the movie industry, do today. Bottari, G. Raccolta di lettere sulla pittura, scultura ed architettura. Rome. 1759, III. p.234. Cited by Hatfield, p.102. 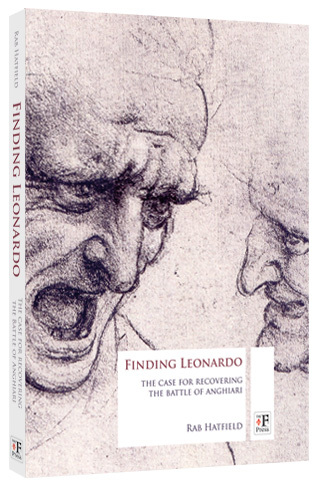 Hatfield, R. Finding Leonardo - The Case for Recovering the Battle of Anghiari. The Florentine Press. 2007. The da Vinci Detective (Documentary, excerpted) Darlow-Smithson Productions 2006 link ; excerpt edited by H Niyazi. Vasari, G. Lives of the most eminent painters, sculptors, and architects. DeVere, G.C (Trans.) Ekserdijan, D.(ed.). Knopf. 1996. Vol 1. p.637. If there is one thing (and really, there are many more than one) that I have always admired about Prof. Hatfield, it is his logic. This is the way he works through difficult problems (like the position and function of Masaccio's Trinity at SMN) and this is the best approach in this case too. Hats off to logic! Thanks, Hasan, for taking the time to write this excellent analysis. While I’m not 100% sure if Professor Hatfield’s reconstruction of the fresco and its location is correct, I must say it does have a certain plausibility, and it will be really interesting to see what Seracini and his team will dig up in the future. There is, however, one thing I’d like to point out concerning that crucial account of the fresco by Anton Francesco Doni. Professor Hatfield takes this account as proof that “the painting was still in good enough condition in 1549 – that is, probably after Vasari wrote his dismissive words about it”. This, I’m afraid, is slightly inaccurate. Let me explain: The 1549 mention of Leonardo’s painting is taken from a letter Doni wrote to Alberto Lollio who was about to visit Florence for the first time. Essentially, in this letter (dated August 17, 1549), Doni provides the addressee with a sort of guide to the city’s art treasures. The problem is, however, that Doni himself was *not* in Florence at that time and hadn’t been there for a couple of years; rather, Doni wrote that letter in Venice, where he had been living since 1547. He therefore couldn’t have seen Leonardo’s Florentine fresco after 1547 (btw, the first lines of the letter make it explicitly clear that Doni is writing his “guide” of Florence *from memory*), and his account can only be read as a testimony to the painting’s condition *in 1547* – or perhaps even earlier. After all, the letter contains a list of several dozens of artworks all over Florence, and while we may assume that Doni had seen them all at some point in his life, it’s not very likely that he went to check on each and every one of them in 1547 before leaving for Venice. So at least three (and possibly more) years passed between Doni seeing Leonardo’s fresco and the publication of Vasari’s Vite in 1550. As evidence against Vasari, Doni’s account is therefore less conclusive than Hatfield and his collaborators suggest. P.S. : Doni’s letter in its entirety is available in an 1822 edition on google books. One of my thoughts on Vasari and his opinion of Leonardo's painting is that I believe he would have down played Leonardo's work slighty. I believe he may have outwardly been making a rougher assessment of Leonardo's work and it's condition to help persuade the the decision makers to give Vasari the commission for his fresco. They may have asked Vasari to provide his opinion on the state of Leonardo's painting and to provide alternatives for the future use of this space. I'm not sure if it is known how the correspondence went between Vasari and the Palazzo Vecchio. 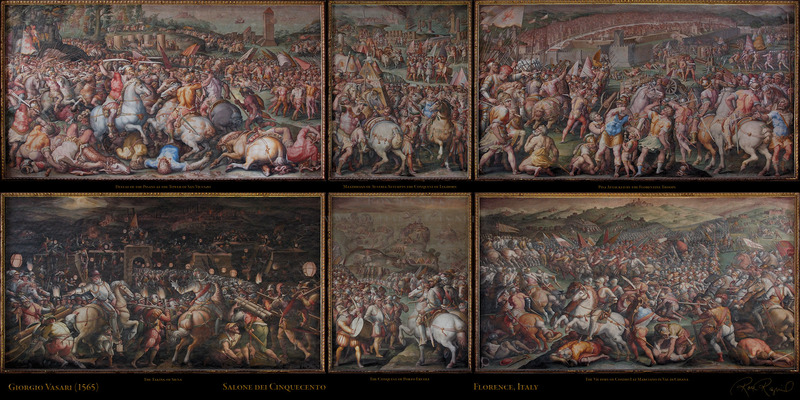 Was it where Vasari was to come and analyze the current status of Leonardo's painting and if found to be in a bad state, provide a newer battle scene? Or was it already decided by the palace ahead of time to have Vasari perform his work in the location where Leonardo's crumbling painting stood? On the flip side, I believe Vasari, knowing Leonardo as a true master, would have thought it to be sacrilege to completely destroy his work (in any state) and would have devised a method to save or encapsulate Leonardo's painting. Is it known how famous and important Leonardo was at this point roughly 30 yrs following his death? @Alexandra - thanks for the feedback, and for your role in helping bring this interesting discussion into a more public forum. @historienerrant - Many thanks for your contribution. As we are dealing with subjective accounts, an adjustment for "slightly" inaccurate (or accurate) does not really mean much as long as the gaps in data are clearly acknowledged. Hence, these two accounts - likely written within a three year time frame - give us a different spin, where at the very least Vasari may be focusing on, or perhaps even overplaying the deterioration. I alluded to this difference in my very first question to Professor Hatfield, whose response (and text) do not conceal that there is a discrepancy. Barring another source coming to light, or Seracini's team (and those that follow) shedding more light on what may be underneath Vasari's fresco, we may never know the extent of the condition of the piece c.1547-1550. In any event, the main use of the Doni source in the text reviewed is to establish the position of Leonardo's scene above where the Twelve sat. One point which Hatfield (and others) make which I had not included was that Vasari was noted to be visually quoting sections from Leonardo's work - it is argued that these are taken from he being able to see them as his fresco was being designed, but I did not include these at is it could be equally argued they were sourced from extant coloured copies of the work that were were around by 1540-50s. Vasari's own description mentions colour (ie. red cap). In a note on this Hatfield muses why the cartoon is referred to in the past tense and why the red cap is described in the present tense. It is also mentioned that the contents of the 1550 and 1568 descriptions by Vasari did not change. I hope to add a small clarification on this later. @Jeff - great points - it can be validly argued that Vasari was granted the commission to refurbish the room because there was nothing grand left of the fresco, regardless of its author. In the same instanve of course, he could have acted to preserve the work as best he could, as seen in the Masaccio example. This seemed to be a major factor is establishing the plausibility that Vasari may have acted to preserve what was left, despite its deteriorated state. As updates are announced, 3PP will do its best to stay on top of the coverage. Oh, there’s one more thing: I don’t think that Doni’s and Vasari’s accounts are as contradictory as they’re generally made out to be. It seems that over the years, that quote from Vasari in particular has been somewhat misread and over-interpreted. The thing is, if you pause to consider what Vasari actually says, you realise that he doesn’t make any explicit claims about the painting’s condition in c. 1550. All he says is that the paint began to peel off *in 1505* while Leonardo was working on it. He doesn’t provide precise information, however, on how bad or how far-reaching the damage to the fresco really was. And it should be noted here, that there is one small yet significant difference between the 1550 and the 1568 version of Vasari’s description: In 1550, Vasari merely writes that the fresco “began to peel off in such a manner that in a short time he (i.e. Leonardo) abandoned it”, period. Only in 1568 does he add “seeing it spoiling” to the end of that sentence. Apparently, of course, the damage was bad enough for Leonardo to abandon the project, but then again Leonardo does have a reputation for abandoning projects halfway through, so he probably didn’t need that much of an incentive to do so. A possible explanation for the matter is found in the Codice Magliabechiano (written c. 1540) which states that only the upper part of Leonardo’s fresco was peeling off while its lower part remained in a good condition. (If I remember correctly, this source has already been cited in one of your earlier post on the search for Leonardo’s fresco.) If we choose to believe this source, it is perfectly plausible that both Vasari and Doni are right, only focussing on different aspects of the story - a difference that is easily explained by the fact that Doni was giving a description of what was still there in 1547/49, while Vasari was trying to explain why Leonardo left the project unfinished. @historienerrant - cheers for the follow up. I would submit the focus being different for the two accounts relates to the authors' intentions. Doni is describing notable sights in Florence, whereas Vasari is giving us a biography of a brilliant but erratic artist - viewed from this motivational perspective the end results fit somehwat neatly. I will add a clarification on the Vasari version(s), particularly the point about tense as I have more information. The contents of the apparently anonymously written Il Codice Magliabechiano [published by Frey in 1892] are discussed, particularly at length in the section on the fresco and its accompanying annotations. Accounts referring to the defective nature of the surface by Antonio Billi and Paulo Giovio are also related. I would like to re-iterate the aim of the post was to produce a summary of the key points as a book synopsis, not reproduce the entirety of the Professor's research in a blog post. Hence, to anyone interested in further detail, I would very much recommend the book - especially for its annotations which are a goldmine to those intrigued by primary source accounts. In any event, thanks to all for the thought provoking contributions. It will be interesting to see what happens next in this investigation.